Preparing for our trip we packed 10 suitcases, 5 carryons, and 5 peronal bages. 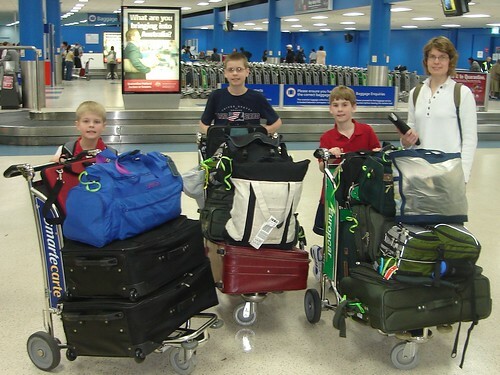 The suitcases they had to weigh less then 50 pounds. We loaded it all in Mike's CRV and Mr. Marose's van. Then we headed off to the airport. At the airport we checked our baggage in. Then we went through security and there was no lines. Out on the concourse we saw the plane's. I was so excited. While we were waiting we saw two 747's and plane's coming and going. There were a lot of eating places and shops. We had fun in the Creative Kids store. In the store we saw planes that you could squeeze or push a button and it would sound like an airplane taking off. When we left for San Francisco it was my birthday. It was snowing. On the flight to San Francisco I got to sit by the window. My whole family got three rows. Rows 39, 40 and 41. My Mom had to sit by herself in row 41. Peter and Karl sat in row 40 and my Dad and Me sat in row 39. When we took off it was cool it felt like I was floating in the air. It felt cool when the plan tilted back about to take off. After a little bit we looked out the window and saw lots of now on the ground. A little bit later we saw lots of mountains in Wyoming and Utah. We saw the great salt lake. After we got off the plane we walked around the airport. My Dad took a picture of us in San Francisco, CA. Then we ate at a good restaurant and had a big salad and half a pizza. Then we went to a concourse and sat for awhile for our flight to New Zealand. We've arrived safely in Rockingham, Western Australia. All three of the flights were smooth and on time. We had a wonderful 6-hour tour of Auckland, New Zealand during our stopover, despite the fog that threatened some beautiful views. We're staying 2 nights in an apartment hotel while we get settled in the house and oriented to the area. All slept well the first night. Today we walked through our house and toured the school campus - we're pleased with everthing we've seen and everyone we've met. More news to come when we have a chance (when we get an internet hookup instead of working at an internet cafe). Log in and then check out Dane's blog and the new photos in our Photo Galleries. Arrival in Perth - Read the ad: "What are you bring into Australia?" Apologies for being slow with news on the website and in replying to emails. We're still waiting for an internet connection at home. Telstra (phone company) assigned us a landline phone number which we used for a couple of days until Telstra decided to assign the same number to someone else. Until that's sorted out this week we can't get internet set up. We're very anxious to have this done so we can get caught up on a long list of overdue emails and start Skyping (internet phone). On the left is a photo of the boys at the beach on Warnbro Sound. This is the beach that's directly west of our house about 0.7 miles. We've been there a few times now, and they walked there once from the house with Lanette. Lanette and I finally had our visas approved this week. Lanette will take the boys into downtown Perth (the “CBD” or Central Business District as they refer to the downtowns here) on Monday for their visa-required medical exams. Once those are processed, the boys will be able to attend school. In the meantime, Lanette and the boys have been spending their days getting business done (banking, licensing, etc. ), doing tons of shopping, and hitting the beaches. Peter, Karl, and Dane are loving the beach scene, but it's Autumn here so it's only warm enough to go knee-deep into the water and not much more at the very empty beaches. With our visas approved, our shipping container was finally released to start the customs clearing process which may take 10 to 20 business days. So the home furnishings are a bit sparse though some people from the college brought in beds, a dining table and chairs, a few lounge chairs from the college's staff room, television, refrigerator, and some basic kitchen items. After borrowing a staff member's car for about 10 days, we moved on to a rental car. Yesterday we made our first trip into the big city of Perth (45 minute drive) to shop for a car. We put money down on a used Hyundai Trajet (like a mini-van), and will pick it up when we figure out the financing. Cars don't rust here, so the used ones hold their value (and their bodies) much longer than we're used to in Minnesota. We're seeing tons of 20-year old little Ford Festivas running around here. (Some might remember my red '87 Festiva). We also made a stop at the new IKEA in Perth and at King's Park for scenic views of the city. Check the website for a few new sets of photos in the Photo Gallery from some of our excursions to the beaches and into Perth. Also, see Peter's Blog where he's drawn a floorplan of the house were renting. And we've got more stuff we all want to post, but it may have to wait until we get the internet connection at the house. Right now we are staying in a rental house with 3 bedrooms and 1 bathroom. It has a car port (open garage) and a patio. It is a little small, but it is fine because when we get our shipping container, we won't have much stuff to put in the house. Here is a view of the house that I drew. Yesterday, we went into Perth to look for a car. We found a white van and decided to buy it. It is a Hyundai Trajet. After we bought the van, we went into King's Park, a huge park up on a hill overlooking downtown Perth . We got out on top of the hill and took many pictures of the city (photo by me at right). Then, we went shopping at IKEA. A few days ago, we found out that Mom and Dad have been granted their visas and that we are just waiting for our medical exams tomorrow in Perth. The IT classes up through Year 8 meet once per week. I have two classes for each grade level up through Year 7. I think there are about 5 classrooms of Year 8 students, but I only teach one session of an elective for them. The computer graphics and multimedia classes meet once per week (two sessions of the multimedia class). The two Christian studies courses meet two days a week. Altogether, I think I have 13 different lessons to prepare per week (in my last teaching position I had about 33). With my position being filled by substitutes since the beginning of the year, there was very little structure or documentation for what was being done with the IT classes. In general, there isn't much curriculum in writing for IT here. There is much to be done in planning for IT and I've got a Senior School IT teacher who is very eager to work together on this. For the moment, though, it looks like I'll be “winging it” quite a bit for most of the IT classes. The photo is of the Administration Building (right) and Learning Resource Center ("library" - left) at Living Waters. I've got more photos to upload in the coming days to try to give a sense of what this sprawling campus looks like. No, we have not seen one yet. This photo is as close as we've come to spotting one. Everyone says there's plenty of them around here. You've got to find them at the right place and time. Yesterday Lanette got a tip on which road to head out on at dusk to find the kangaroos. We really haven't made an effort to look for them. The surf and beach are much more reliable sources of entertainment so far. We are still waiting for internet access at home. (Now we have internet!) We've got bunches of emails that we haven't had a chance to reply to... but we'll get to it when we can. Much more that we also want to post here... we'll get to it. The boys are into their first week at school. I'll upload some photos of that soon, along with more beach scenes. We picked up our new used car yesterday in Perth - a Hyundai Trajet. I'll try to post some photos soon. The boys are now experiencing life on the campus at Living Waters Lutheran College (LWLC) in Warnbro. Warnbro is part of the larger city of Rockingham (pop. 80,000? ), and this is where Living Waters began as a primary school 11 years ago. Following about 9 years of a million-dollar-building-fund-drive-a-year-each-year, the campus now rather complete and serves students from "kindy" (preschool age in the US) through Year 12 (high school seniors). Another campus was started a few years ago at Halls Head about 20-30 minutes south of here where students through Year 7 attend. Below here is an aerial view of the Warnbro campus with some labels to identify the building. With a warmer climate and open air for hallways, the winter rains can make navigation between buildings interesting - like it did last week. Trying something new here... Using the free application Google Earth, I've created a fly-through virtual tour of the area around us by combining placemarks with photos we've taken. You can see it for yourself if you've got Google Earth installed on your computer and if you download and then open the file below. 1. (if needed first) Download the application Google Earth and install it. click here to go to the Google Earth website. 2. Download this file I created for the tour. (right-click on the word Download at the beginning of this step, and from the pop-up menu choose 'Save as...' or 'Save Target as..."
3. Find the downloaded file "Rockingham Tour.kmz.zip." It will probably be on your Desktop. If it still has ".zip" at the end of the filename, you'll need to unzip it using a program like Zipeg (look for the Mac or Windows link at http://www.zipeg.com/). 4. The result of "unzipping" the Rockingham Tour.kmz.zip file will be a new folder of a similar name but without the .zip. Open this folder. 5. Double-click on the file in that folder called "doc.kml". If Google Earth has been installed, then clicking on this should start it up and import the tour. If clicking the file doesn't get it to open up Google Earth, try opening Google Earth first, and then from inside Google Earth try to Open>File... the doc.kml file. 6. In Google Earth, look in the list in "Places" for "Temporary Places" and then within that look for "~GEQ8f4pL.kmz". Click on the triangle beside "~GEQ8f4pL.kmz" and then on "Rockingham Tour" to reveal the contents of the tour. 7. Press the "Play" button (has a triangle on it, below the "Places" section) to start the tour. The program will jump from place to place in the Rockingham area and show you some of the photos we've taken. 8. If you want to keep the Tour in your Google Earth application, choose "File > Save > My Places". 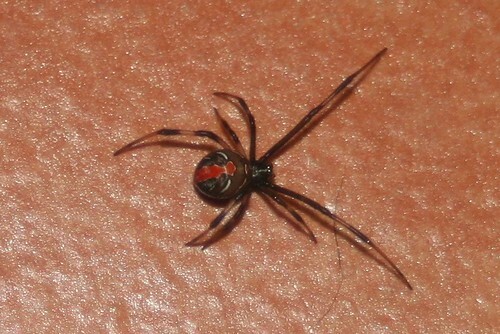 We can't say we've seen a kangaroo or any dangerous snakes, yet, but now we can say we have seen the infamous redback spider... in our house! Needless to say, Karl and Dane are sleeping in Mom and Dad's bed tonight instead of their own makeshift beds on the floor. If you want to know more about these relatives of the black widow, check them out at the Australian Museum Online. People can actually die from their bite, although it's very rare since they came up with an anti-venom. You'll have to read about their strange mating routine and why the females become widows. If you look at what we can watch on TV down under, we could just as well be sitting in your living room back in the States! The Aussie national TV networks include: ABC (not the US ABC, but the Australian Broadcast Corp.), Seven, Nine, TEN, and SBS. Below here is a snapshot of what's on tonight. You'll see some familiar shows. You can imagine if that's just one selected hour on one night, the list of all the American shows we get to watch is almost endless. We get to see plenty of our old favorites like David Letterman, Mythbusters, and Extreme Makeover: Home Edition. That list above includes just American shows on Aussie cable stations. But we also get many of the same stations from home such as: Fox News, Discovery Channel, History Channel, Biography, Animal Planet, Nickelodeon, and Disney. Add to that the "international" versions of ESPN and CNN. We also get a mix of shows borrowed from England. So what are missing?... BASEBALL!!! A few games a week are shown on ESPN international, but usually at odd hours of the day/night and so far none of the teams we're interested in (like, the Twins!). In place of baseball, we're watching quite a bit of Rugby, Cricket, and especially Aussie Rules Football ("Footy"). Like American football, Footy dominates the weekends here during autumn and winter (happening now). Cricket is the big summer sport, but the national team plays "test" matches during our winter where it's summer like in England and the West Indies, and the individual players are playing in the new Indian (India) Premier League which is hugely popular here (Go Mumbai!). In a recent email, Lanette's brother Kurt had remarked that he tried the link to our Pastor Mike's sermon podcasts and got a taste of the Aussie accent we're hearing. It's not just the accent of the pastor, though, that's different about our Australian Lutheran church. I have to be careful in drawing a comparison based on the Lutheran churches here in Western Australia (WA). We're a long ways from the heart of Australian Lutheranism is in South Australia (Adelaide and the Barossa Valley). The Lutherans out here are rather sparse. There are only 17 Lutheran congregations in WA. There are currently only 9 pastors serving them, with only 6 of those on full-time and receiving full pay. Our church is very, very casual and contemporary compared to any Lutheran church we experienced in the States. Anywhere from 80 to 100 worship each week at our one Sunday service. You won't find any formal liturgy, highly structured order of service (no printed bulletins - just PowerPoint), organ, or traditional hymns. The Lord's Supper is celebrated every Sunday. We have a variety of people who take part in a worship band that leads all of the singing. Lanette and I have quickly come to appreciate our Pastor and his messages. While the congregation's worship practice is not so familiar to us, Pastor Mike's messages are right on with what we'd expect from a Lutheran pastor. Pastor Mike also serves the even smaller congregation 30 minutes south of here at Hall's Head on the other campus of the College. The church doubles as the school chapel and all-purpose room, so the chairs are set up and taken down several times each week for each of the sub-school's chapel services and assemblies, as well as whatever other group needs the open space. The college does not have a gymnasium or auditorium, so this is the one big open room. The photo on the right shows the chancel of the church. Lanette took this photo during the Junior School assembly this week in which Karl's class was featured and demonstrated what they've learned about the human skeleton. That's Karl at far right. As Karl needed to learn the Australian National Anthem for his class' lead role in the Junior School assembly this week, all of us have been working at picking up the lyrics and the tune. The anthem "Advance Australia Fair" is rather new to Aussies as it replaced "God Save the Queen" only in 1984. So, even the typical Aussie doesn't do well at singing along, especially if they go beyond the first of four verses. We celebrated Foundation Day today (Monday) with a day off from school. We headed to the beach to romp around in the sand and the water. It's been a bit rainy in the last week, so today's beautiful sunshine and 21°C (70°F) weather was lovely to enjoy. The forecast for the upcoming week here is a top of 22-25°C and sunny everyday through Sunday. Foundation Day is only a Western Australian holiday. It commemorates the founding of the Swan River Colony (Perth) in 1829. We have the day off from school and many businesses were closed, but otherwise we didn't notice much else being done to celebrate.